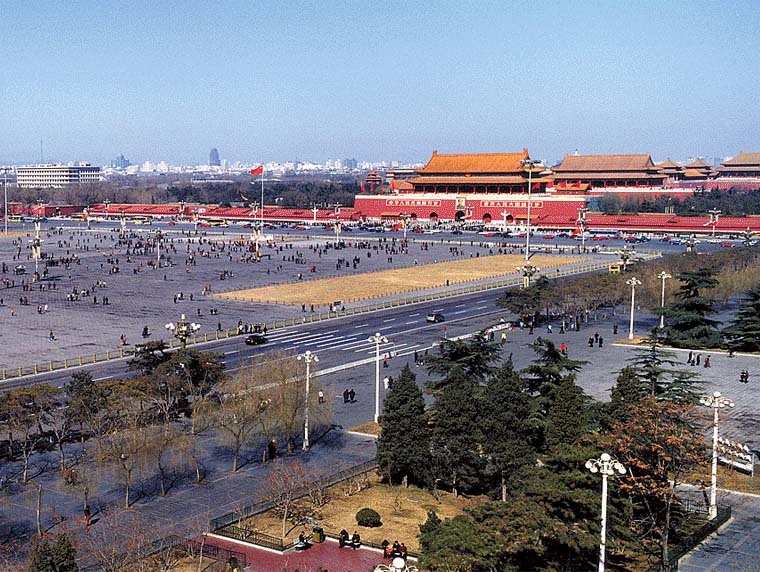 Tiananmen Square is the large plaza near the center of Beijing, China, named after the Tiananmen (literally, Gate of Heavenly Peace) which sits to its north, separating it from the Forbidden City. At the north end of the Square is Tiananmen Tower. Initially built in 1417 during the Ming Dynasty (1368 A.D.- 1644 A.D.), the Square was the front door of the Forbidden City. The most important use of it in the past was to declare in a big ceremony to the common people who became the emperor and who became the empress. Until 1911 when the last feudal kingdom was over, no one could enter the Tower except for the royal family and aristocrats. Tiananmen Square has great cultural significance as a symbol because it was the site of several key events in Chinese history.